Here is a bit of surprise trivia for you guys! Leave it to Jerm to always be keeping you on your toes! As far as Tampa Bay area events go, it won&apos;t get much better than this! 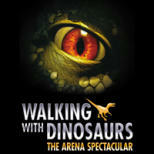 In case you did or didn&apos;t know the famous Walking with Dinosaurs Tour will be here October 14-18 at the St. Pete Times Forum here in downtown Tampa. I have two 4 packs of tickets to give away for today and tomorrow. Today&apos;s version will be held on Twitter, and tomorrow&apos;s will be a Facebook contest! Now of course you know that I gotta make you work a little bit in order to get these tickets, so there are a few trivia questions I need you to answer first. Ya know, just to make sure you are worthy...lol just joking, all of my readers are worthy and I love you guys very much! Here are the rules again, just in case you forgot...1 - You have to be following us on Twitter.com (www.VisitTampaBay.com/Twitter); 2- Answer two questions about Dinosaurs You have to re-tweet the original tweet in order to be eligible to win (a lot of people forget this one, so make sure you re-tweet separately); and 4 - You have to answer the question(s) on Twitter and be the first to do so. Name the winged creature featured on the Walking with Dinosaurs show that would most likely be the first to know when it would rain? The tail of this dinosaur was without question one of the most dangerous weapons ever evolved by a plant-eating animal? Okay, hope I didn&apos;t stump you too badly. Remember there are 4 tickets on the line today so if you wanna win, then you better get to answering! Okay guys that all I got for today, be sure to check back tomorrow and pay attention to Facebook! If you are not a fan than I suggest you become one, as only our fans can aswer and win! Stay tuned for giveaways and updates on fun things to do in Tampa Bay!